Slugs can do major damage to your favorite flowers and plants overnight. To keep those creepy crawlers from devastating your garden, try any of these 5 easy solutions. Even the smallest slugs play a big role in the ecosystem, feeding on decomposing matter and in turn providing protein for wild critters like raccoons and chipmunks. But however important these slimy creatures may be, that doesn’t make it any more pleasant when we find them noshing on the plants we worked so hard to grow in our gardens. If your outdoor spaces have been overrun, try one of these methods for deterring and eliminating slugs. Copper creates an unpleasant electrical shock when slugs come into contact with it, which will deter them from passing. 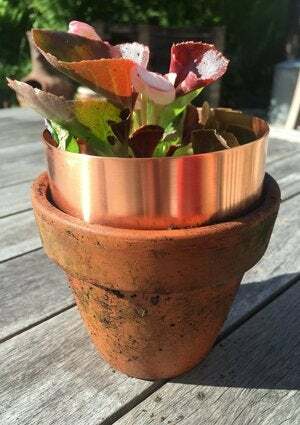 Create a barrier around your beloved garden by surrounding it with 4- to 6-inch copper flashing, or by wrapping susceptible plants with copper tape. Not only will the slugs stay away, but you can also reuse the copper flashing for several years to come. Keep in mind that this trick will only deter the slugs—not kill existing varieties. 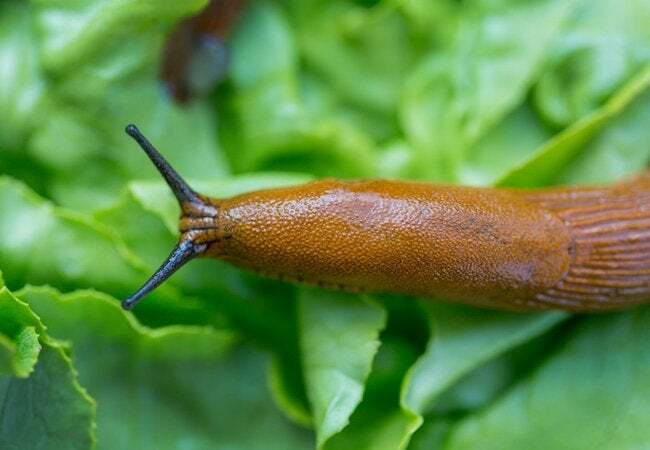 Slugs like beer as much as they like the leafy greens of your garden plants. Crack open a beer and pour it into a few margarine tubs, then distribute the containers in various places around the yard, burying them so that about an inch remains above ground. The slugs will be attracted to the scent, crawl into the tubs, and drown overnight. Dispose of the containers the next morning in your trash or compost bin. A slug’s Achilles ankle is its soft body, easily irritated by sharp or dry materials. Use this to your advantage by sprinkling wood ashes, diatomaceous earth, gravel, or lava rock in a wide band around individual plants—or the entire garden—to discourage slugs, as they won’t want to crawl across the bumpy barrier. Wood ashes have the bonus benefit of adding potassium to your soil and raising the pH, so consider choosing that method as your first line of defense. Next time you snack on a citrus fruit like grapefruit or orange, unpeel the rind carefully so you can keep one bowl-shaped half in tact. Poke a hole that’s large enough for a slug to fit through, and then sit the fruit upside down like a dome in your garden. The sweet scent will lure slugs in, distracting them from their usual meal: your plants. If a predator doesn’t get to them first, collect the fruit scraps the next morning and kill any live slugs by dumping them into a container of soapy water. If you’re feeling particularly vengeful, gather your salt shaker and a flashlight, and venture out at night for some real slug hunting. Sprinkle a little salt on every slug you see; it will draw the water out of it’s watery body, causing the creature to dry up. It seems gruesome, but this solution is very effective. Just be cautious when dispensing salt, as an abundance of the seasoning can harm your plants and soil. For the most part, slugs thrive in highly moist environments. One of the best preventative measures you can take is to make sure your garden does not stay overly wet. Keep plants spaced apart so that air can circulate between them, and water early in the day so extra moisture has time to evaporate before nightfall when the slugs come out to feast. For another creative way to get rid of slugs, try using Coca-Cola! Watch our video below to learn more.